The Spring 1988 Whitman volleyball teams stand tall in my memory, though only a few of the individuals hovered near six foot in height. Gil Thompson coached the varsity teams and I coached the JV coed team (see photo). There were 24 players on that JV coed team--that's a lot of footwork to be trained to pass, set, hit and block. Part of the challenge that season was to give everybody meaningful time on the court during matches and to maximize the practice contacts needed to improve. 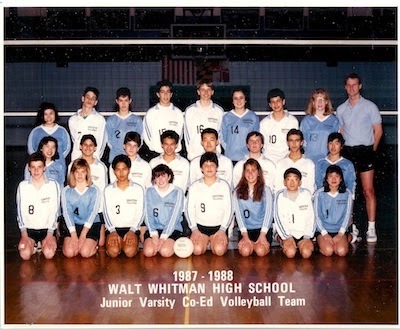 I thought about that 1988 Whitman team today when my current Wootton boys team played Whitman. I thought about the many steps taken by that 1988 team to get better. I thought about how we went toe to toe with some good teams in Montgomery County that year. I thought of some tracing their footsteps back to their parents' homelands in Burma, Brazil, South Korea, Israel, and China, and bringing back candies and soda for their coach. I thought about the giant leap Ingrid Chen made when she was named All-Met by the Washington Post two years later. In addition to Ingrid, the names of these good souls were Dmitri Siegel, Sarah Smith, David Hisle, Mia Keefe, Ryan Kaplan, Mauro Rosenberg, Liz Henry, Noah Berlin, Lee Chen, Chris King, Patricia, Andrade, Aung Htut, Francesco Cibo, Christine Huo, Jiwon Paik, Carlos Castro-Neves, Ben Goldberg, Youngmin Park, Ana Corta, Barbara Sullivan, and Belle Chen. Their teammate Gustavo Machado (second row, third from the left, behind #3) and varsity player Dov Fischman were also in my thoughts today. Gustavo and Dov, along with Samir Gafsi and Bruno Perrone, were brilliant young men who were suddenly gone later that same year. Rest their souls. I think about them to renew my perspective about life, volleyball and the greater value of teams. The youngest of the group is turning 40 this year. Their feats have no doubt been many and great since 1988. I also thought about how that team travelled to Wootton that year to play against one of the legendary Mickey Lipman-coached teams that dominated Maryland volleyball in the 1980s. Now I find myself sitting where Coach Lipman created a dynasty of seven straight state championships. Lipman's feat is humbling to those following in his shadow. And on the bench with me is a team of 16 players and 4 managers. That's a lot of footwork currently being trained to pass, set, hit, and block. Every Spring 2014 Wootton player got to play against Whitman, except for Henry Shu, who is just now getting back on his feet after hobbling a bit this season. In addition to Henry, their names are Nathan Xie, Benjamin Wang, Henry Shu, James Ho, Andrew Merchant, Cary Chin, Justin Wu, Victor de Avila, Omar Nunez, Jeremy Chung, David Li, Mark Pang, Robert Severynse, Adam Kaplan, Paul Malinauskas, Ethan Frymark, Max Shin, David Juhnn, Noah Ru, and Timothy Chang. All good souls contributing to the greater value of team. May their feats be many and great.